This preparatory study is conducted using the Methodology for Ecodesign of Energy-using products (MEErP) as established in 2011. This methodology was developed to allow evaluating whether and to which extent various energy-related products fulfil certain criteria according to Article 15 and Annex I and/or II of the Ecodesign Directive that make them eligible for implementing measures. This methodology requires the contractor to carry out 7 tasks, ranging from product definition to policy scenario analysis. Task 7 – Scenarios (Policy, scenario, impact and sensitivity analysis). Tasks 1 to 4 can be performed in parallel, whereas 5, 6 and 7 are sequential. Task 0 or a Quick-scan is optional to Task 1 for the case of large or inhomogeneous product groups, where it is recommended to carry out a first product screening. 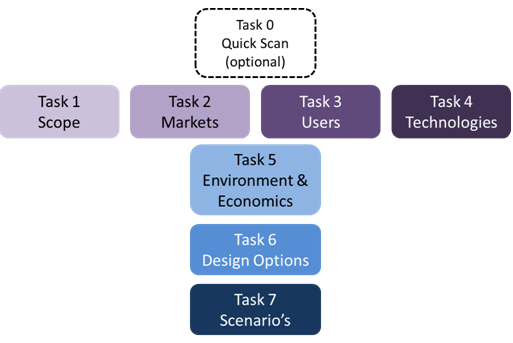 The objective is to re-group or narrow the product scope, as appropriate from an ecodesign point of view, for the subsequent analysis in tasks 2-7. What are Energy-related products as defined in the Ecodesign directive? The European Commission is dedicated in giving stakeholders the opportunity to provide input to this study thereby creating a fully transparent and open process. This website is the main information exchange platform between the study-team, the Commission and the stakeholders. When task reports become available, stakeholder meetings will take place. The meeting dates, venues and how to be invited to the meeting will be announced through this website.